Currently many a novice with no proven track record are criticising me for buying so much of Eversendai and Jaks with margin loan. But when they go up, they will say that I have the foresight to foresee the future. I am only a business man. As I am not an accountant, I can hardly understand a company’s balance sheet. I am also not a chartist. But then how could I buy so much of Latitude Tree, V S Industry and Lii Hen? 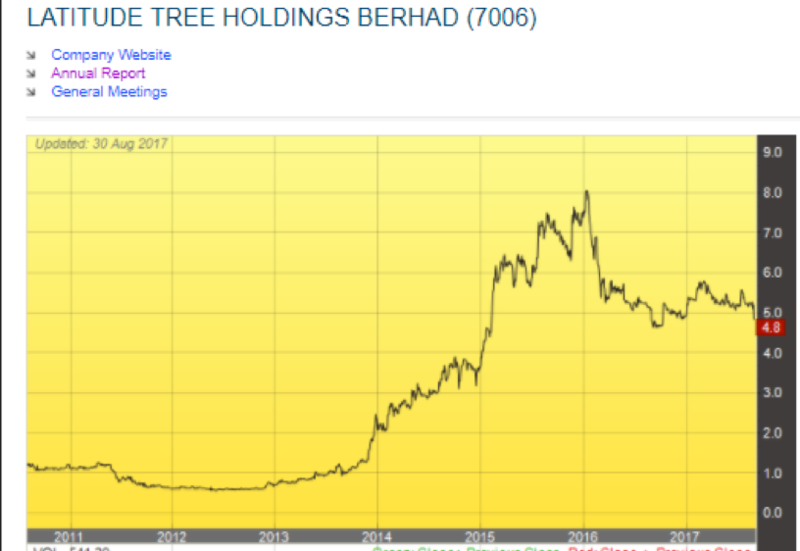 The above chart shows that Latitude went up from Rm 1.00 to Rm 8.00, an increase of 800 % within 2.5 years. Its 2015 annual report showed that I was the 4th largest shareholder holding 6.32 million shares. 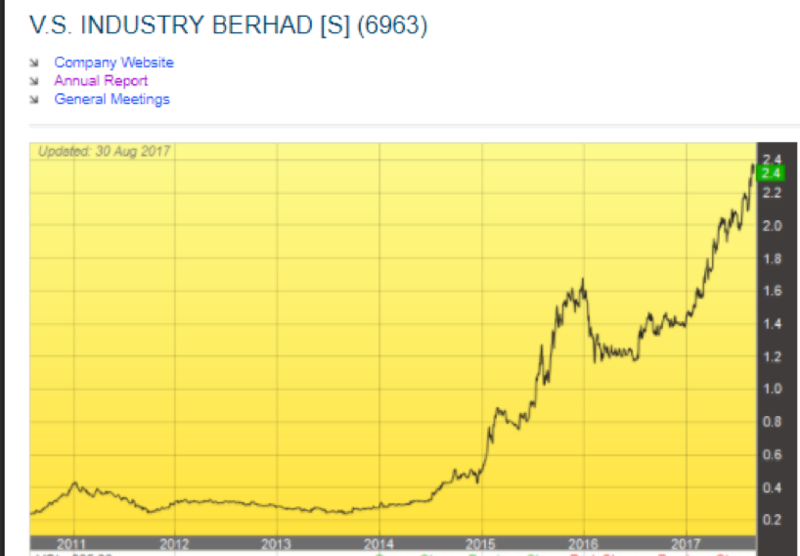 The above chart shows V S Industry went up from 30 sen in June 2014 to Rm 1.70 in Dec 2016, an increase of 550 % within 18 months. Its 2015 annual report showed that I was the 2nd largest shareholder, holding 102 million shares. 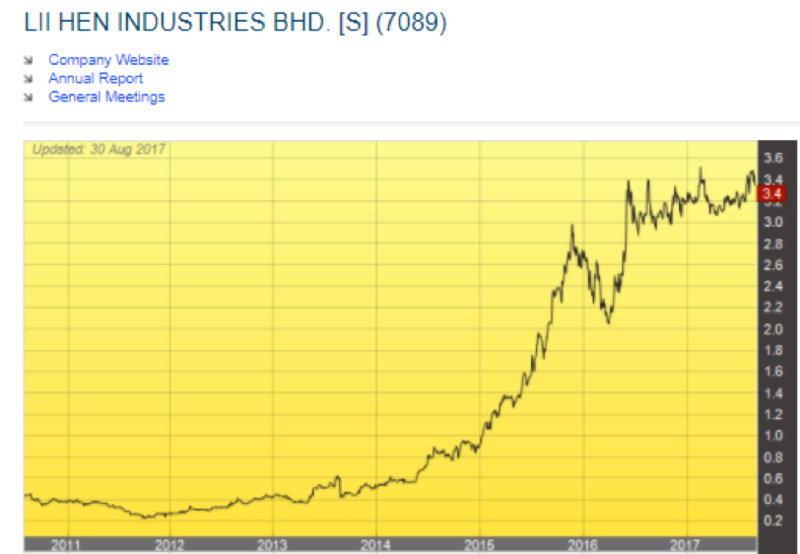 The above chart shows that Lii Hen went up from 40 sen in mid 2013 to Rm 3.00 in Oct 2015, an increase of 750% within 2,5 years. Its 2015 annual report showed that I was the 2nd largest shareholder, holding 19.80 million shares. I have sold all my Latitude, V S Industry and Lii Hen to buy JAKS and Eversendai. As a result, my average cost for Jaks and Eversendai is very small. I strongly believe these 2 counters will perform in the same way as Latitude, V S and Lii Hen. As I said earlier, I am only a business man and I can foresee the future profit growth of these 2 companies. Remember, profit growth prospect is the most powerful catalyst to move share price. Besides boasting to satisfy my ego, my purpose of writing this article is to teach investors to look at the company’s business always and should not be afraid to hold on the shares even if the company reports one quarter of poor profit. Patience is the key to successful investing. Chartists will not buy JAKS and Eversendai because they are dropping to their rock bottom. Expert chartists will only buy when their prices have gone above their 70 day moving average. Which is riskier, buying at rock bottom prices or buying when they have gone up above the 70 day moving average?